April 9, 2018 Robert W.
Custom banner stand displays are very popular at the many events and shows held in Las Vegas Nevada. Custom banner stand displays are used extensively at these shows in order to get a message across to the people attending. These banner stand displays come in a multitude of sizes to accommodate your space needs at these shows. Many times the booth sizes at these shows and events are very cramped and display graphics are needed that can stand alone in this limited space. Banner stands are a wonderful display graphic to fill this need. With all the conventions and trade shows in Las Vegas, these are very popular graphic displays. Custom banner stand displays come in many sizes. The most popular banner stand size is the 33″ x 78″ adjustable banner stand. An adjustable banner stand allows for the perfect height adjustment to your graphic so that it displays perfectly. These banner stands with carrying case cost less than $100 and can be made the same day in emergencies, if not an emergency, these stands only take a day or so to print and assemble. The banner stands come in widths of 24″ to about 5 feet wide and in either standard or premium styles ( premium have a chrome base). The graphic itself is either on a 13 ounce vinyl banner or a 10oz anti curl substrate that makes your graphic look professional. Large format printers use eco solvent or latex inks to print your graphic. The newer large format printers utilize the multicolor system with 8 inks that allow for a wider array of colors and depths. These inks are environmentally friendly and will last a long time indoors. Custom banner stand displays are made at most of the sign shops that cater to the events and shows in Las Vegas. These sign companies are normally located within a 1/2 mile of the Las Vegas strip and offer delivery service to your location. July 16, 2016 Robert W.
Las Vegas custom 89101 custom banners allow you to customize a vinyl banner for your business or event. These custom made banners are full color and can have your company logos, pictures and other designs printed directly onto the banner to help you market the advertising message you want to sell. While you can purchase pre printed banners in sign shops and online such as ” For Lease” , “For Rent” , “New Ownership”, etc., custom banners allows you to personalize your banner and tailor your marketing message to your intended audience. Las Vegas 89101 custom banners are printed right here in the Las Vegas area by professional sign shops that have state of the art wide format printers with inks that are specifically designed to last in the hot Las Vegas sun. The vinyl outdoor banners last well more than a year outdoors and are guaranteed not to fade even in the high temperatures 110 degrees and above that Las Vegas has during the summer months. Las Vegas 89101 custom banners are used by businesses in Las Vegas to promote their businesses. A local furniture store is constantly using custom banners to promote sale items to the public. One week they may be advertising mattresses, the next week they may be advertising the sale of bedroom sets. They learn to use these banners for a few weeks and then rotate the banners so that the furniture store always appears to have new and exciting deals on furniture and accessories. These banners are printed with different background colors so as to give the store a colorful and fresh look. Many other businesses such as restaurants, cleaners, auto repair stores, parts stores, etc., use these banners because of their popularity. Las Vegas 89101 custom banners can be found at any of the local sign shops or print shops in Las Vegas. July 2, 2016 Robert W.
Las Vegas 89109 custom banners can be made very quickly in case you forgot your graphics for the Las Vegas trade shows and conventions. Many times, through no fault of your own, display graphics are lost while they are being transported to your exhibit show. Consequently, there is a large sign industry in Las Vegas that can assist you in replacing your graphics or designing and printing your graphics to have them ready for your convention. Everybody loves to come to Las Vegas because of all the fun that can be had here. Las Vegas is the best and most popular destination for trade shows and conventions than any other place on this planet. There is so much to do in Las Vegas and so much fun to be had. Although Las Vegas is known as a gambling mecca, people forget about all the other amenities that are offered in Las Vegas such as fine dining, entertainment, world class accommodations, etc. Las Vegas also has a very large sign and print industry to help make sure that all the conventions and trade shows go off without hitches. These sign shops have state of the art large format printers that can print banner signs very quickly in bright and beautiful colors. Las Vegas 89109 custom banners can many times be made in the same day at prices far less than what you would pay back home. With the average printing price of a vinyl banner at around $2.00 a square foot, Las Vegas remains a competitively priced alternative for your sign needs. These banners are printed on 13 ounce banner material with state of the art inks that last a long time. For really large banners in Las Vegas, try www.LasVegasLargeBanners.com for your banner printing needs. Have a great time in Las Vegas at your convention or trade show. Las Vegas Custom Banners Made For You. April 16, 2016 Robert W.
Las Vegas custom banners allows for you to make the perfect banner for your event or business. Las Vegas custom banners can be made to express exactly what message you are trying to get across to your clients. Las Vegas custom banners can be made through online banner design programs or at sign shops where you can sit with a graphic designer and help him or her make that perfect banner. 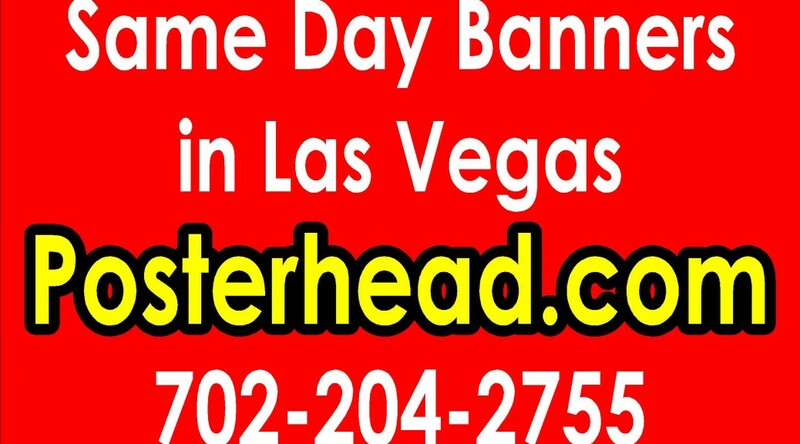 For even bigger and larger banners, websites like www.LasVegasLargeBanners.com can assist you with really large banners. Las Vegas custom banners can contain as many colors as you want, pictures and logos in a variety of sizes. Even odd shaped banners can be made to make that banner most special. Special events like parades for the Fourth of July have there specials look that might have the red, white and blue colors along with simulated explosions or the Liberty Bell for enhanced effects. Christmas banners may have Santa Claus, elfs, sleighs and a host of other pictures reflected of Christmas. 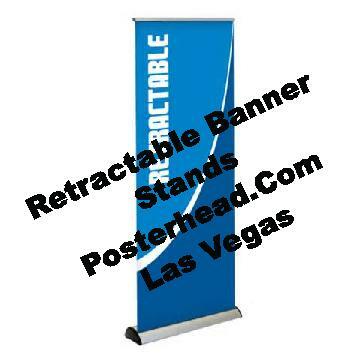 Las Vegas businesses also use custom banners to promote their products and services. These custom banners are then hung from the buildings and fences at these business locations so that they can be seen by the hundreds, if not thousands of people, who pass by their business location everyday. 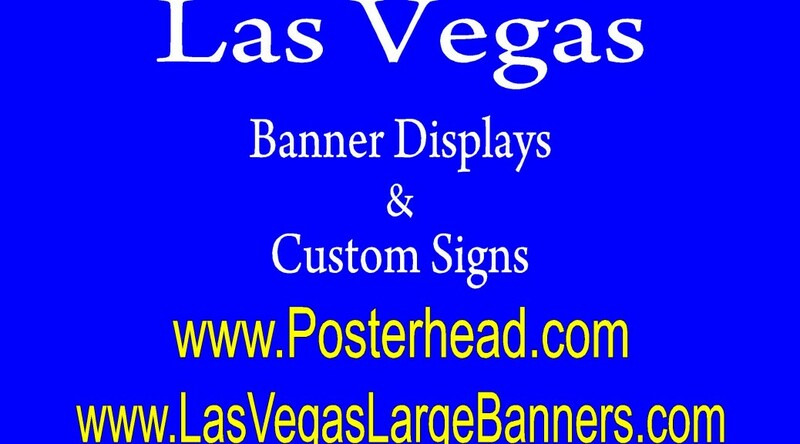 Las Vegas custom banners are not expensive and a downright cheap form of advertisement. The average cost of a custom banner is about $2.00 a square foot and come with grommets so that they can be easily hung and installed. These banners are printed onto a 13 ounce banner material by large format printers using state of the art inks that will not fade in the hot summers of Las Vegas. These custom banners can be found at local sign shops and print shops in the Las Vegas area. January 7, 2016 Robert W.
Las Vegas custom banner printing can get you that special banner that is custom made for your business, event or convention. Las Vegas custom banner printing allows you to fully customize your vinyl banner ( for both indoor and outdoor usage) at a special price in the Las Vegas area. Las Vegas custom banner printing usually starts with a 13 ounce vinyl banner material and then printed directly with large format printers with specially formulated, environmentally friendly inks that are designed for both indoor and outdoor usage. These inks are designed to last a very long time in outdoor weather, even during the Las Vegas hot summer months where temperatures can get to around 120 degrees. The banners then come with grommets that are placed evenly around the banner so that it can easily be installed with basic tools or can also be professionally installed. Many businesses use these custom banners to advertise their businesses and have their logos printed on the banner or have information printed on the banners that is only pertinent to their business. While banners can be purchased online or through sites like Amazon or Google, custom banners are specifically made for your event or business. Many sign shops also have online banner design type programs in case you want to create your own banner. Las Vegas custom banner printing is also popular in Las Vegas because of all the conventions and trade shows that are held in Las Vegas every year. More conventions are held in Las Vegas than anywhere else. Las Vegas is a great place to live and visit and is a lot of fun, which is why everybody wants to have their conventions here. People that attend and exhibit at the trade shows and conventions use custom banners to help display their goods and services that they offer. December 20, 2015 Robert W.
Paradise Nevada 89118 custom banners allows you to make the perfect vinyl banner for your store to market yourself. These vinyl banners are custom made to your specifications to make sure they are distinct and set you apart from the competition. Paradise Nevada 89118 custom banners come in a variety of sizes to match the needs of your store. The rule” the bigger the better” applies, but what happens if you do not have a lot of room on your building to display your banner. Businesses place banners on the exterior of their buildings to get people to notice them from the roadway. As Las Vegas has increased in population, so has the amount of vehicles on the road. Consequently, smart businesses are taking advantage of the increased traffic and placing banners on their buildings so that they can be seen by the hundred( if not thousands) of vehicles that use the roads of Las Vegas every day. A large 5ft x 10ft banner can be seen from a long distance. If you do not have the room on your building for a banner, perhaps a smaller banner closer to the street and hung on a fence might get the attention of people passing by as well. Paradise Nevada 89118 custom banners are not hard to get. You can order them online by doing a Google search for the term ” custom banners” or you can go to one of the local sign shops in Las Vegas and have them design and make your banner relatively cheap. Most businesses prefer to have a local sign or print shop make the custom banners in case anything goes wrong and it allows them to see the design and make sure they have input into the design of their own banner. It is sometimes difficult to explain what you want on a banner over the telephone or internet. Spring Valley 89147 custom banners allows you to create your own custom vinyl banner that is best suitable for your event or business. Instead of the generic banner that has ” Grand Opening”, ” New Management” or something similar, you can have a custom vinyl banner designed for you at one of the local signs shop in the La s Vegas area. Vinyl banners are a great way of letting people know about your event or business. At the local sports parks in Las Vegas, many of these parks do not have scoreboards or other signage that allows for fans to know exactly what is going on. They do not know the scores nor do they know on what size of the field to sit. Many sports parks have multiple games being played at one time and it is terribly difficult to know what field to go to. Consequently, many sports teams are now proudly displaying vinyl banners to help identify who they are. These banners are attached to fences or the back of chairs and can easily be put up and taken down. Spring Valley 89147 custom banners are also being used at stores and businesses throughout the Spring Valley area of Las Vegas to help customers find them and also to attract new customers. Traffic has greatly increased in the Spring Valley area and smart businesses are taking advantage of this by using large vinyl banners as sort of a billboard and placing these vinyl banners at their locations to grab the attention of passing motorists. Businesses that are doing this have found that their business has increased leading to more sales and higher profitability. A simple pizza banner can alert passing motorists that you have a pizza for sale at a great price and try to entice them into having it for dinner.